If you follow me on Twitter you'll know what's coming in this post! I really wanted to post a Nerd Lacquer polish today but the weather has been so bad and I think it deserved some sun! I need some sunshine and then I can do all of the swatching I need to do in one day to last me a little while! Anyway, I had some photos already taken of one of my new Barry M Nail Paints so I thought I'd post that today. The only thing is, it's ANOTHER PINK! I seem to be buying and blogging about so much pink recently but this is the last one for a while, I promise, at least for ten days! I'm normally drawn to blues and greens all year round but for some reason this spring I've been loving pinks, and even though originally I didn't want to post another pink, I loved this one all over again once I saw my photos! I got this polish the other day in Superdrug because they had a save £1 when you bought two polishes deal, which obviously I couldn't resist! I bought Blue Moon, Cyan Blue and Bright Pink and Bright Pink is what I have to show you today. See the rest of that haul here. 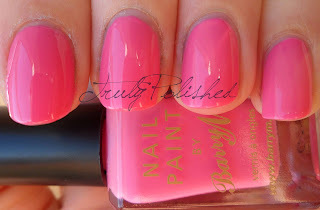 Bright Pink is a bright(ish) bubblegum pink creme. It's the kind of pink that I don't usually wear but I was drawn to it for some reason. Normally I wear more blue based pinks so it's nice to have a little bit of a change! The formula on this was really good, I got perfect coverage in two coats and it was really glossy so I didn't use topcoat for the photos below. I think if I wore this for longer I'd definitely wear a topcoat, but that's mainly because I find Barry M polishes chip after a few days on me. 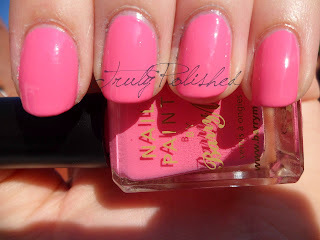 See the rest of my photos and review by clicking "Read More"
What I love about this polish (and I really love it) is that it takes on a different colour depending on the lighting. 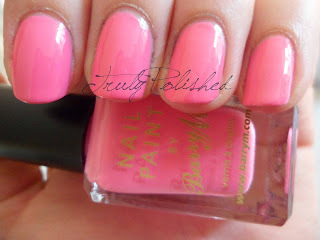 In the natural light it's a bright bubblegum pink, in the shade it really glows brightly (not neon, but very bright!) and in the sunlight it looks like a beautiful pastel pink. I definitely think that everybody should own a pink like this! Even if you don't usually like or wear pinks, this could be for you! I got this at Superdrug where it retails for £2.99. This is such a nice color. I really like it and it's pretty for spring.